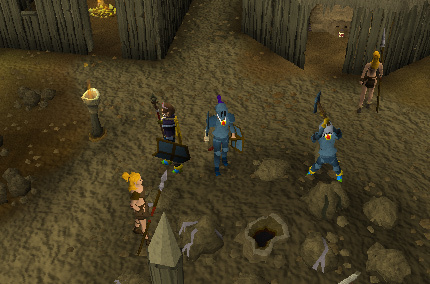 The Stronghold of Security is a Miniquest for both freeplayers and members that teaches those who dare to go near it about how to keep their account safe, while giving generous rewards at the same time. The dungeon entrance in the center of Barbarian Village. The stronghold can be found in the middle of Barbarian Village between the rocks of the mine and consists of four levels with different monsters on each. Unfortunately you can only get the rewards once, but can kill the monsters for combat experience for as long as RuneScape exists. It is possible to complete the mini-quest at level 3 even though there are monsters all the way up to level 86, so you can get the great rewards on any pures you have if you want to. Climb down the hole and you will appear in a room with a message in your chat box. If you should happen to die in the Stronghold of Security, or if want to go back in and don't want to face the monsters, you can simply click on the portals you will see at the entrance of the stronghold and near the treasures. This is a very simple mini-quest because all you have to do is answer questions about the security of your account. Because it is all about making your account secure, you must have recovery questions set to be able to get a reward, so make sure you have some set before entering the dungeon or else you will have to log out part way through and set some. There are four floors, each having a different look to them, and the monsters getting harder as you progress, but the aim of each floor is the same. This aim is to reach the chest at the end, learning about account security on the way. One of the first things you should notice when you enter the dungeon is that the doors are never alone, but situated in pairs. The first door you will go through normally, but when trying to go through the second door you will be asked a question about account security. There are 20 different questions, each having three options that you could chose from, but only one being correct. Whether you get a question right or wrong, there will also be an explanation about what to do in the situation asked about. So, here come the questions that will help you through the dungeon, they're all easy so you should know them already, but nobody can know everything. Q: What do you do if someone tells you that you have won the RuneScape Lottery and asks you for your password or recoveries to award your prize? A: Don't tell them anything and click the 'Report Abuse' button. R: Press the 'Report Abuse' button and fill in the offending player's name and the correct category. 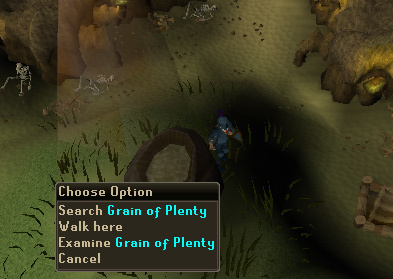 Q: Does Jagex really hide your password if you accidentally say it in game? A: No – Jagex does not block your password. R: We do not block your password. Do not say it in game as someone may steal your account! Q: What do I do if I think I have a keylogger or virus? A: Virus scan my computer then change my password and recoveries. R: Removing the keylogger must be the priority, otherwise anything you type can be given away. Remember to change your password and recovery questions afterwards. Q: Where should I enter my RuneScape password? A: Only on the RuneScape website. R: Always make sure you are entering your password only on the RuneScape website as other sites may try to steal it. Q: Where can I find cheats for RuneScape? R: There are NO RuneScape cheats coded into the game. Any sites claiming to have cheats are fakes and may lead to your account being stolen if you give them your password. Q: How will Jagex contact me if I have been chosen to be a moderator? A: Game Inbox on the RuneScape website. R: We only contact our players via the game Inbox which you can access from our RuneScape website. Q: Can I leave my account logged in while I'm out of the room? R: This is the safest, both in terms of security and keeping your items! Leaving your character logged in can also can also allow someone to steal your items or entire account! Q: My friend used this great add-on program he got from a website, should I? A: No, it might steal my password. R: The only safe add-on for RuneScape is the Windows client available from our RuneScape website. Q: My friend asks me for my password so that he can do a difficult quest for me. Do I give it to him? A: Don't give him my password. R: You can make it alone and the success will taste even better. Don't forget you can ask people for advice too! Q: Why do I need to type in recovery questions? A: To help me recover my password if I forget it or it is stolen. R: Your recovery questions will help Jagex staff protect and return your account if it is stolen. Never use personal details for recoveries or bank PINs! Q: Who can I give my password to? R: Your password should be kept secret from everyone. You should *never* give it out under any circumstances. Q: What do you do if someone asks you for your password or recoveries to make you a member for free? Q: How often should you change your recovery questions? R: This is the ideal, every few months change your questions, but make sure you can remember the answers! Don't use personal details for your recoveries. Q: Will Jagex block me from saying my PIN in game? R: Jagex will not block your PIN so don't type it! Never use personal details for recoveries or bank PINs. Q: Who is it ok to share my account with? R: Your account may only be used by you. Q: A website says I can become a player moderator by giving them my password, what should I do? A: Don't tell them anything and inform Jagex through the game website. R: By informing us we can have the site taken down so other people will not have their accounts hijacked by this scam. Remember that moderators are hand picked by Jagex. R: A good recovery answer that not many people will know, you won't forget, will stay the same and that you wouldn't accidentally give away. Remember: Don't use personal details for your recoveries. Q: What do you do if someone asks you for your password or recoveries to make you a player moderator? A: Don't give them the information and send a 'Abuse Report'. Q: What is an example of a good bank PIN? A: The birthday of a famous person or event. R: Unless you tell someone, they are unlikely to guess who or what you have chosen, and you can always look it up. Never use personal details for recoveries or bank PINs! Q: What do I do if a moderator asks me for my account details? A: Politely tell them no and then use the 'Report Abuse' button. R: Report any attempt to gain your account details as it is a very serious breach of RuneScape's rules. Never use personal details for recoveries or bank PINs! Each of the four floors have different monsters on them, and the harder the monsters, the better the reward. This floor is the easiest to get past by far because none of the monsters will automatically attack you, whatever your combat level is. You will enter the floor in the north-west corner, and the reward is on the east side of the floor. The two main routes you can get there are keeping north and keeping south. 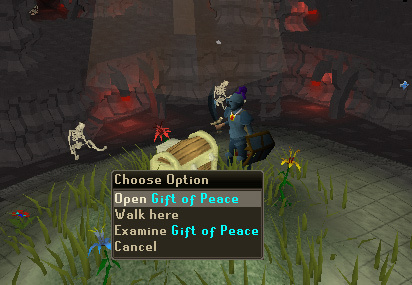 Once you reach the chest, better known as the 'Gift of Peace', and have opened it you will receive your reward of 2000 coins and the 'Flap' emote. The monsters on this floor don't go above level 53, so there isn't much need for food and as long as you stay to the north part of the floor. You will enter the floor in the north-east corner, and the reward is in the center of the floor. To get there you should stay to the north so that you don't go near the higher level monsters and have the chance of getting hit damage. On this floor the reward isn't in a chest, but a sack called the 'Grain of Plenty'. Search it to receive your reward of 3,000 coins and the 'Slap Head' emote. All stats that have been lowered will also be restored. This is the first floor where you may struggle at lower levels. There are monsters up to level 68 that can reduce your Strength level with their Magic attacks. They can also hit reasonable amounts of damage, so remember to bring food. You will enter the floor in the south-west corner, and the reward is in the center of the floor. To get there you can take either a left or right turn at the first fork, then carry on round keeping inwards all the time. Although you can go either way, because of the way the monsters walk around, it is suggested you take a left turn to start with, then keep to the right, running through any rooms with monsters in. 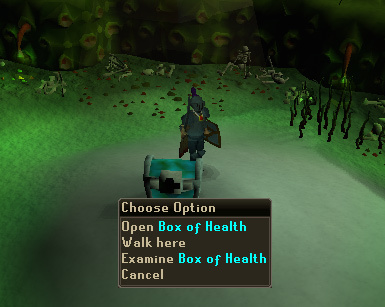 As with the first floor, the reward can be found inside a chest called the 'Box of Health'. Search it to receive your reward of 5000 coins and the 'Idea' emote. This is the fourth and final floor of the dungeon, having the hardest monsters, which are the easiest to get past. The highest level monsters are level 86, but with carefully timed running, getting past them can be very easy. If you do unfortunately mis-time your run, you could get hit hard, so food is suggested whatever level you are. 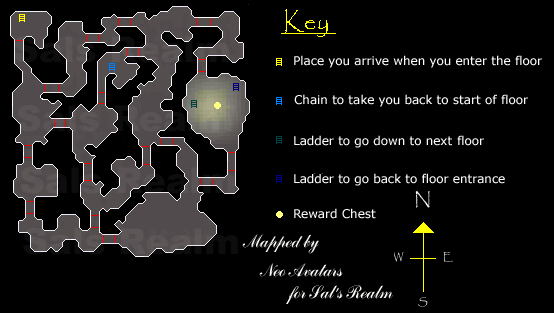 You will enter the floor in the center of the east side of the dungeon, and the reward is in the room just to the west. Although you can almost see the reward from where you enter the floor, there is a bit of a walk to get there. Head north-west until you are about to go into the large room in the north-west part of the floor. This room is full of level 83 non-aggressive Shades. They are easy to kill and drop Shade Robes as loot. The reward on this floor is different to that of the other floors because you won't get coins, but something special instead. The reward can be found inside the 'Cradle of Life'. Search the cradle the receive the 'Stamp' emote and a choice between either Fancy or Fighting boots. Each pair of boots has the same stats, but have different looks depending on what you want them for. The Fancy Boots are multi-coloured, so look good at a fancy dress party, while the Fighting Boots look good with most sets of combat equipment. They also give free players a brand new look due to the very limited range of footwear they have. If you get bored of one pair of boots and want the other pair then you can chose to change them by going back to the Cradle of Life and searching it again. 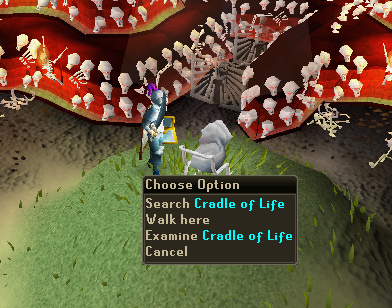 If you ever lose your boots, just go back to the Cradle of Life and search it to get another pair.